Threads of Time is a Nine Month Block of the Month Program. The pattern was designed by Juli Hendrickson of JJ Stitches in Sun Prairie, WI and features her latest collection of shirtings and calicos. 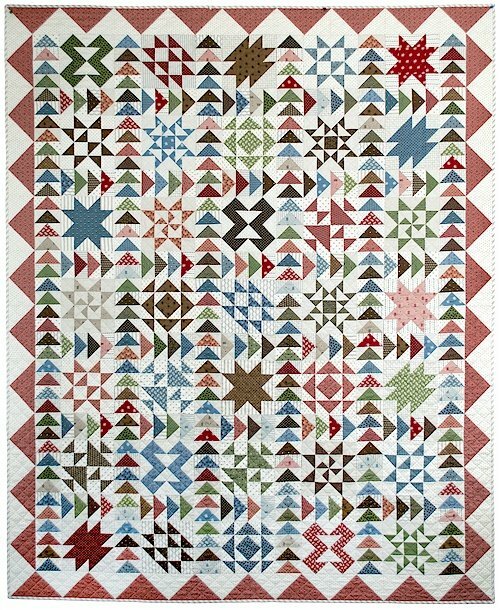 Inspiration for both the fabric and the setting for the quilt came from personal quilts in Julie's collection. OR $ 295.00 one time payment with free shipping for destinations in the US! Our goal is to ship using USPS by the 20th of each month. If you would prefer an alternate shipping method, please contact WashTub Quilts. We will also give International customers the option to mail 3 months in a single mailing to save on shipping. Please email WashTub Quilts (info@washtubquilts.com) if you would like more information regarding this. The Threads of Time BOM will earn you points in our "Thank You Rewards"! Please understand if you default on a BOM/Club membership you will forfeit your Thank You Rewards and will no longer earn points on future purchases.